Graduate students (M.Sc. and Ph.D.) supervised jointly by members of the IOLR staff and by faculty members from all of Israel’s academic institutes are offered a variety of opportunities to carry out their thesis research at IOLR's research centres. Financial support for graduate studies and research is granted occasionally by IOLR on a competitive basis. 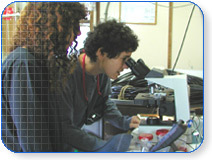 The Admiral Yohay Ben-Nun Foundation for Marine and Freshwater Sciences offers a number of fellowships each year to Israeli graduate students studying for M.Sc. and Ph.D. degrees at one of the Institutions for Higher Education in Israel and carrying out their thesis research at one of IOLR’s research facilities, under the supervision of IOLR’s scientists in one of the following disciplines: Oceanography, Limnology and marine resources. Applications should be submitted no later than 31.7.2017. The application forms are available at IOLR’s website. For additional details please contact Ms. Lea Teitelbaum, lea@ocean.org.il, 04-8565221.